Isla was super excited when I told her we were making these for her friends at preschool for Valentine's day. This is a great craft to include the kids in plus its affordable and cute! Step by step guide after the jump. We had heaps of broken crayons hiding out in the bottom of our drawing supplies bucket, perfect! Gather your broken bits of crayon, and chop them up so they fit into your mould. The kids could have fun with this bit and just break them into smaller pieces with their hands, just be warned, this is the messy part. Next fill your mould with the chopped crayon pieces, try to get a good colour mix. Bake at 105 degrees celsius or 220 fahrenheit fan forced for 15 minutes or until all of your crayon pieces have melted. Let the crayons cool until completely hard. I gently placed them in the fridge for 15 minutes. 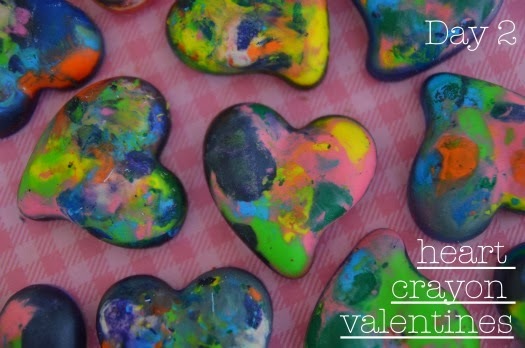 Once hard, pop them out of the mould and you're ready to make your valentines. We used some mini pre made cards to make it a bit quicker. Alternatively you could make your own. Now using your pretty accent paper, find a circle template (the circle needs to be a little larger than your hearts) and trace and cut out a circle for each card. 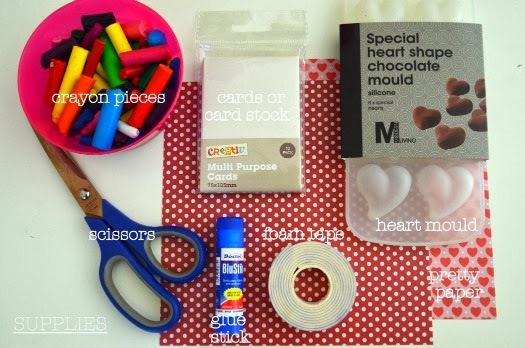 Glue one circle onto each card, then using your foam tape, tape the crayon heart into the centre of each circle. Finally write whatever message you like. We wrote on the front, "I (crayon heart) being your friend" and on the inside we wrote, "Hope you have fun colouring with your homemade crayon". The result...Isla can't wait to give these to her friends at school!